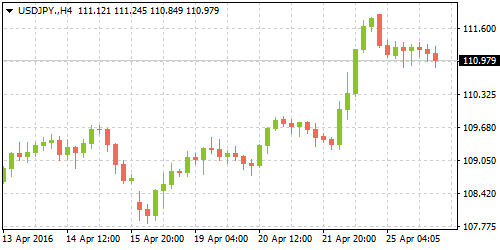 Volatility in the yen remains high due to the uncertainty and speculation regarding the possible actions that the Bank of Japan might take at its policy meeting this week. Earlier on Monday, in an interview with WSJ.com, Etsuro Honda, a high level advisor to Japanese Prime Minister Shinzo Abe, said that the Bank of Japan might prefer to hold off from easing at this week's meeting noting that the central bank would prefer to assess the impact of negative rates for a little longer. 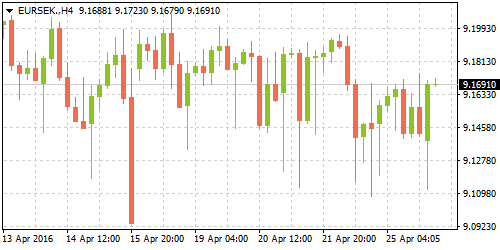 The official comments are starkly in contrast to the Bloomberg reports from Friday which said that the BoJ would cut the bank lending rates to negative sending the yen higher. Business sentiment in Germany soured in April, falling from the previous month's positive report, data from the German Ifo showed on Tuesday. The headline Ifo business climate index in Germany dropped to 106.6 in April, down from March's increase to 106.7 and missing forecasts of 107.1. The Ifo's current assessment which looks at the current business sentiment was also lower at 113.2 in April, down from 113.8 in March while the Ifo expectations which is a forward looking business sentiment index rose to a modest 100.4 in April, slightly better than March's 100.0 reading. The soft data comes on the back of Markit's flash composite PMI which fell to 53.8 in April posting the lowest reading since September of 2015. The unemployment rate in Sweden rose to a 9-month high in March to 7.70%, above forecasts of 7.50% and above the 7.60% registered in February, data from Statistics Sweden showed on Tuesday. Sweden's unemployment rate was at 8.50% in June last year and since then it has been steadily declining. The number of unemployed year over year fell by 8,000 to 406k while employment increased by 66k to 4.833 million. The employment index also fell by 0.10% on the month against expectations of a 0.20% increase. 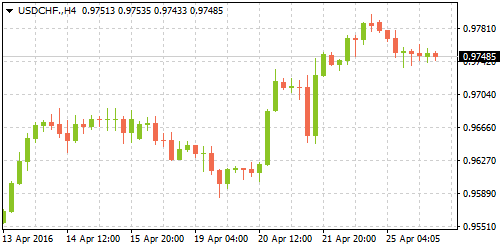 Despite disappointing data, employment rose by a modest 0.30% quarter over quarter in Q1, underlining the upward trend as demand for labor remains high with the economy supported by a continued easing stance from the Swedish Riksbank. Last week, the central bank held rates steady at -0.50% but expanded its QE purchases by adding an additional SEK45 billion, bringing the central bank’s bond purchase program to SEK245 billion. New home sales in the US fell 1.50% for the third straight month in March, according to data from US Department of Commerce released on Monday. Purchases of newly built single family homes fell to a seasonally adjusted annual rate of 511k, missing expectations of 520k. In the first three months of the year, US new home sales were up only 1.30% compared to the same period in 2015. US housing data continue to paint a mixed picture as existing home sales remains the only bright spot in the sector. Despite the weak data, many economists remain optimistic that the housing market will stabilize as jobs improve and mortgage rates remain low. In an otherwise quiet trading day, several US economic data reports stands out. 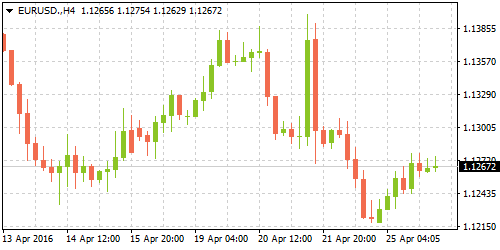 At 12:30 GMT, durable goods orders for March is expected to show an increase of 1.90% following a 3.0% decline in the previous month while core durable goods excluding transport is expected to rise a modest 0.50%, following a 1.30% dip in the previous month. The decline in the durable goods in February came amid a stronger dollar and reduced non-defense capital goods orders. Following this data, the US services PMI from Markit is due later and is expected to show an increase to 52.0 extending the previous month's increase to 51.3. The conference board’s consumer confidence index which measures US consumers’ outlook on the economy, jobs and spending is also due at 14:00 GMT and is expected to show a modest decline to 96 from 96.2 previously.